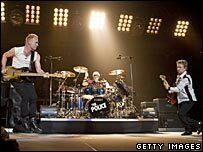 Reunited rock group The Police have started their world tour in the Canadian city of Vancouver. Critics in the country have offered largely glowing praise in their reviews, describing how Sting, Stewart Copeland and Andy Summers enthralled about 20,000 fans as they revived their greatest hits. 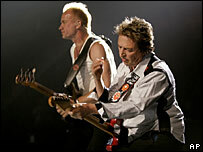 The Police chose not to introduce any new songs and stuck to a crowd-pleasing set list, but did update several of their classics with contemporary sounds. Every Breath You Take was infused with a driving rock rhythm, Every Little Thing She Does is Magic was slung with a slinky jazz vibe and Can't Stand Losing You was ringed with echoing howls. There were many laughs throughout the night. Don't Stand So Close To Me took on new meaning when Sting introduced the song by spraying breath mint in his mouth and sniffing his armpit. Copeland smiled, madly banged his gong quite a bit and raced across the spacious oval stage screaming like a maniac at one point. Summers seemed as low-key as ever. Some fans were in for a nostalgic night of worshipping a band that has made several trips to Vancouver while others, who weren't even born when the group split up in 1984, were out for a memorable night with a group whose music has never gone out of style. The band, which hasn't toured in 23 years, was tight led by a buff-looking 55-year-old Sting strutting his stuff - for brief stints anyway on some numbers. The simplicity of the stage sets, featuring two ovals ringed with lights, complemented the complexity of the songs by the trio of musicians who have had solo careers since they last stoked a stadium full of fans. A melodic, sensual version of Wrapped Around Your Finger featured 54-year-old Summers's strengths with the guitar riffs, 64-year-old Copeland's drumming expertise and Sting's magic on the base, eliciting some of the biggest crowd reaction. The Police hasn't revisited the past - it has tried to improve on it. Sometimes this works, as when Andy Summers takes a long solo in When the World is Running Down, in which you can see the interplay between him and Sting. Sometimes it doesn't, as when they slow down Don't Stand So Close to Me. The new arrangement gets them closer to its threatening lyric, but it loses its pop charm. Starting at 9pm, Sting, Summers and Stewart Copeland hit the stage with a vengeance, opening with Message in a Bottle. The Police made certain it was back. The audience clapped and sang along. Indeed, it was back. Each song was greeted with anticipation. It's not like the Rolling Stones doing Satisfaction every night for 44 years. Walking on the Moon and Synchronicity II haven't been heard in a long time. Each song has changed in slight ways. Wrapped Around Your Finger and The Bed's Too Big Without You are slowed down, but there's more room for solos and dramatic emphasis by vocalist Sting. The Police are back - and they're already displaying signs of greatness. Happiness was also written all over Sting's face as the trio ripped through furious renditions of Voices Inside My Head and When the World is Running Down. The Police are still far from perfect. Spirits in the Material World sounded ragged and Summers stumbled trying to do a knee bend during Synchronicity II, but Copeland more than made up for any deficiencies. He truly is the world's best drummer. 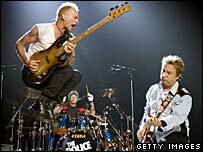 Playing loud and loose like they had never been away, the Police kicked off their first world tour in more than 20 years. Famous fans in attendance included actress Penelope Cruz and Pearl Jam rock singer Eddie Vedder. Sting's wife, Trudie Styler, sang along ecstatically from her seventh-row berth, accompanied by Jerry Moss, the co-founder of the Police's A&M Records label. Tunes such as Every Little Thing She Does is Magic and Walking on the Moon recalled the band's early reggae stylings, while the evening's final song, Next to You, served as a reminder of its punk-rock roots. The stage was a simple affair, a split-level oval floor unencumbered by proscenium or backdrop. The special effects were limited to a retractable percussion setup used by the energetic Copeland on several songs. The simple bang of a gong sent an audience of about 20,000 screaming and launched the Police's 30th anniversary tour at GM Place Monday night. The trio kicked things off with the mega-hit Message in a Bottle to the deafening approval of the crowd. Sting, drummer Stewart Copeland and guitarist Andy Summers, pounded their way through the hits with a confidence that made it feel like it was still 1983.